Moving to a new house did not interrupt Chris’s naughty behavior. In fact, it may have rekindled it. One of the things he used to do is pick at the bottom of closed doors. 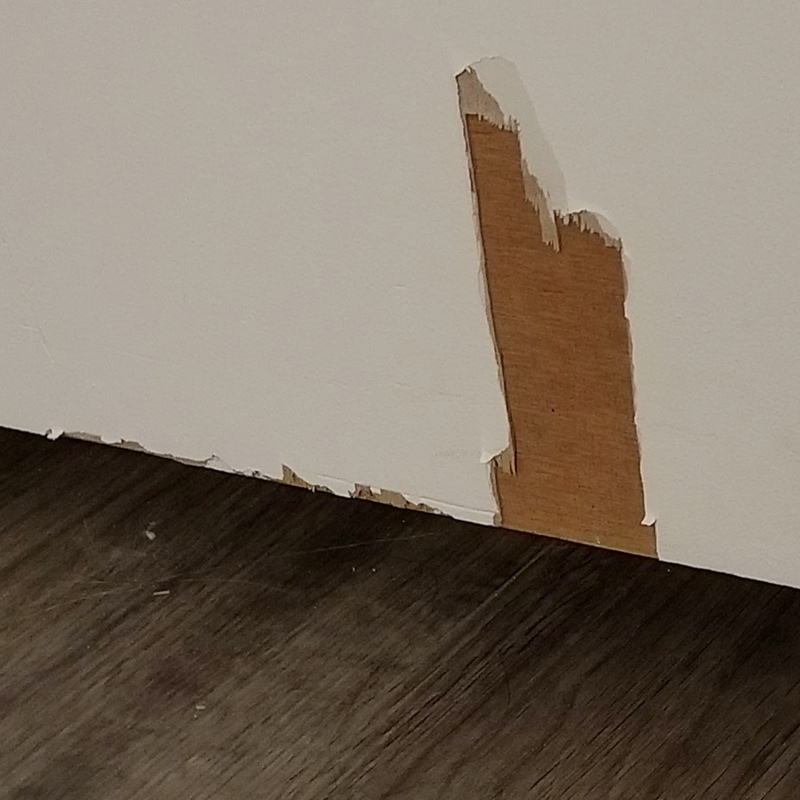 He destroyed the bathroom door in our last house and we had to replace it (read about that here). He stopped doing that at the old house but now he has started up again. I was awakened this morning by the sound of scratching at the door. I lied in bed thinking he would stop but then heard the sound of cracking wood. That wasn’t good. When I opened the door to see what happened this is what I saw. Later that morning I heard the same familiar sound of wood splintering. This time Chris was trying to get into the hall closet. Fortunately, we had already decided that all the interior doors needed to be replaced and I ordered six new doors just two or three days ago. There apparently was a flood in this house at one time and the bottoms of all the doors were not, shall we say, in prime condition. Some of the subfloors needed to be replaced too which we had done when we had the flooring installed. Cabinets are another problem area with Chris. It seems he has to get into every cabinet he can find. 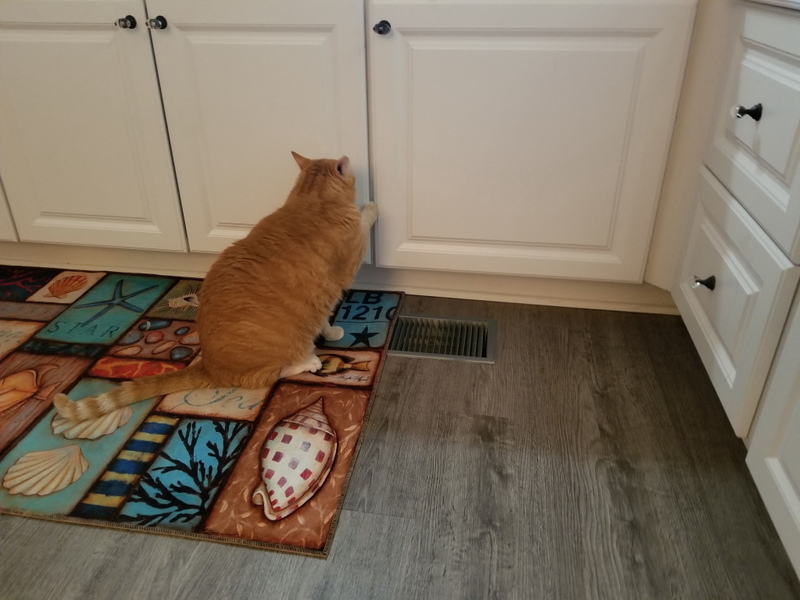 Sometimes it takes him time to figure out which side opens. He is most annoying standing by the pantry and crying. We kept his dry food in a very similar pantry cabinet at the other house so I think he assumes it is in this cabinet, but it is not. It is on top of the fridge. I tried to show him several times his food is not there but he is not convinced. This morning he pulled out a can of wet food. I don’t think he can smell it through the can so I assume he knows it by sight, which surprises me, especially since that was a can of Earthborn that I haven’t fed them for a week. What I have been feeding them is in the cabinet above and the cans are a different color and shape. Hopefully, he will settle down soon. I would hate for him to destroy the new doors. 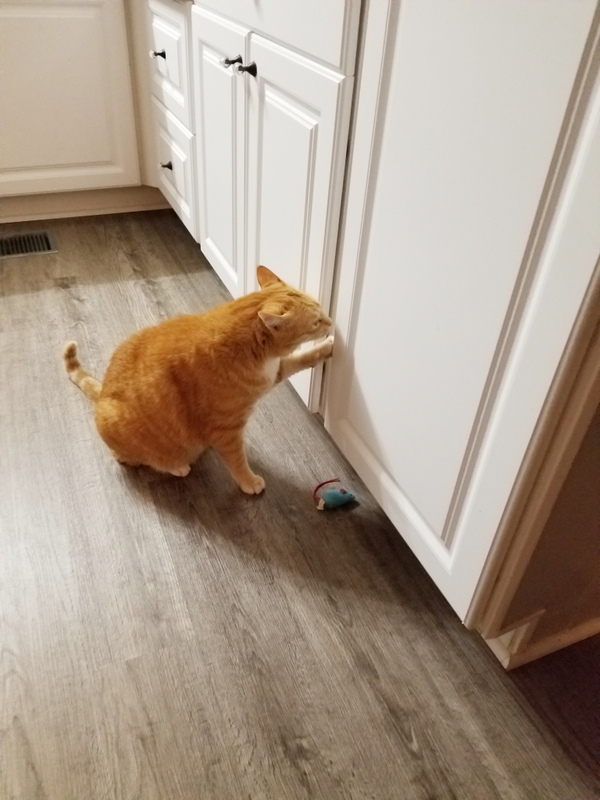 This entry was posted in Uncategorized and tagged Bad Cat, cabinets, cat, doors on September 3, 2018 by Charles Huss. A man on a mission ! Chirs is quite the character. As frustrating as it is for you, I have to tell you, I am DYING LAUGHING….This boy is on a mission!! And…he is too smart for his own good!!!!! The loud meowing is like Cody, Cody is bright but he isn’t as bright as Chris is! Cody has never opened cupboards (thank goodness! ), but he DOES scratch at the door when we shut it, but not as persistently as Chris. I just adore Chris! Chris is sure an adorable pain. He is lucky those doors were being replaced. He probably is bored and we did not order solid doors so he needs to behave. Those old doors sound like they were kind of rotted and, well, flimsy. Hopefully your new doors will stand up to Chris’s abuse. 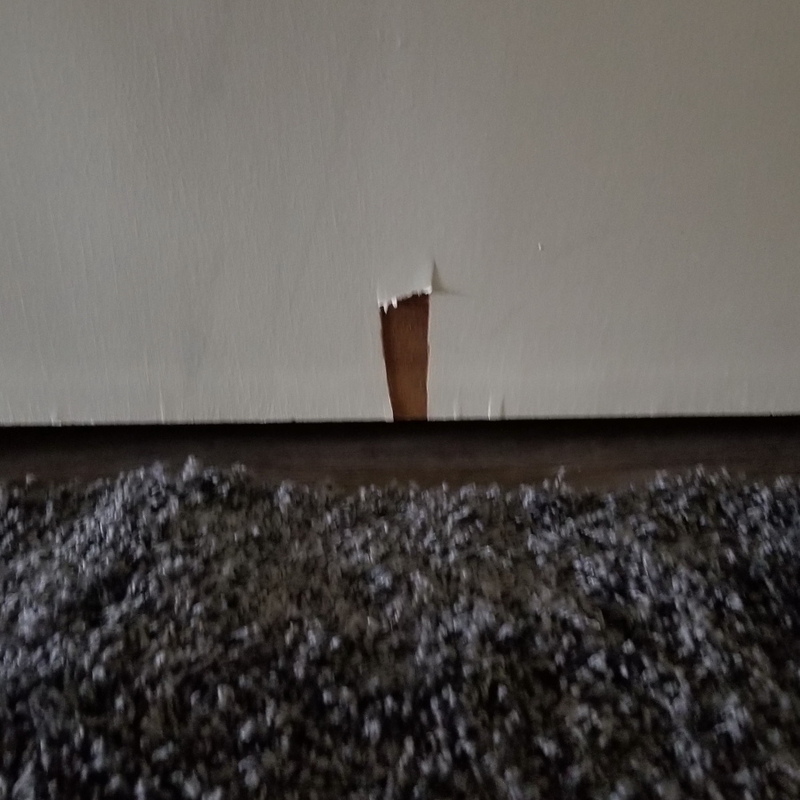 Chris really is something…never have I had a cat quite like him…I think the doors will be ok, he wasn’t able to scratch through the ones we replaced at the old house…but he’ll certainly put it to the test! It’s easier to see if you pull everything out onto the floor. Congratulations on the new house! I hope your cat will settle down for you. Thanks, Matt. He has not destroyed the new doors so we are happy.